Palatine Park District hosts the 15th annual Feet Fest at 9:00am on Sunday, August 26, 2018 at Towne Square, 150 W. Palatine Road, Palatine. 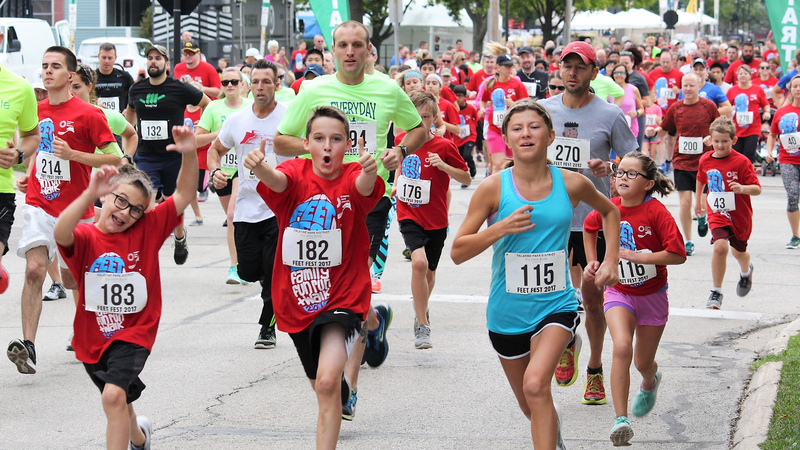 2018 marks the first year for a new Family Adventure Run format of this popular Palatine event. The new two-mile Adventure Run will feature several optional obstacles sized for different family members including cones to zigzag through, hurdles to jump, inflatable walls to climb, a bubble station, a color zone, as well as several other fun activities along the way. Runners and walkers of all ages are encouraged to register. All registered participants will receive a drawstring race goody bag, event t-shirt, medal, and post-race refreshments. The race will have a timed finish with results available online. Pre-registration is available online through Monday, August 20 at 7:00pm using program code 340070-16. The fee for pre-registration is $18 per person. If two family members pay the full fee, the fee for additional family members in the same household is just $15 each. Day of event registration will be available at Towne Square beginning at 7:30am on August 26 for $25 each; the family discount is not available on event day. Pre-race stretching will be guided beginning at 8:45am near the starting line on the north end of Towne Square. The 2018 Feet Fest Family Adventure Run is made possible by a variety of community partners. This year’s Presenting Sponsor is Palatine Bank & Trust. Feet Fest Gold Level Sponsors include Andigo Credit Union, Palatine Vision Center, Zeigler Chrysler, Dodge, Ram, Jeep of Schaumburg, Daily Herald Media Group, and The Playground Games. Feet Fest Silver Level Sponsors include Arlington International Race Course, Eric Esch State Farm Arlington Heights, J2 Massage, Chiro One Wellness Centers, CD One Price Cleaners, and Window Works. Feet Fest Bronze Level Sponsors include Grow Music Academy. For more information about Feet Fest, contact Fitness, Health & Wellness Coordinator Abby Krueger at 847.496.6265 or akrueger@palatineparks.org. Individuals, organizations, and service groups are invited to volunteer at the event as well. For more information, visit volunteer.palatineparks.org or contact Alissa DePue, Volunteer Coordinator, at 847-496-6212 or adepue@palatineparks.org.